In his noteworthy theoretical essay "Experience," Ralph Waldo Emerson writes that humans by nature cannot fully grasp life as lived. If this is so, how capable are we of expressing our experiences in works of art? Despite this formidable challenge, for the past thirty years, scholarship in American art has assumed that works of art are coded and has analyzed them accordingly, often with constructive results. 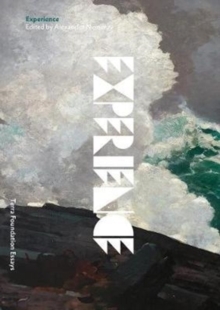 The fourth volume in the Terra Foundation Essays series, Experience considers the possibility of immediacy, or the idea that we can directly relate to the past by way of an artifact or work of art. Without discounting the matrix of codes involved in both the production and reception of art, contributors to Experience emphasize the sensibility of the interpreter; the techniques of art historical writing, including its affinity with fiction and its powers of description; the emotional charge the punctum that certain representations can deliver. These and other topics are examined through seven essays, addressing different periods in American art. Publisher: Terra Foundation for the Arts,U.S.